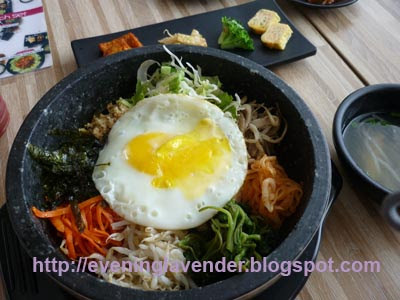 Are you a fan of Korean Food? Maybe you know SkinFood more than Korean Food. Or are you a fan of Korean drama? I am not really a fan of Korean Food but I happened to eat Korean Food on 2 consecutive weekends. Last night I went to the Korean Village in Ampang area and had Korean Barbeque and came out smelling like human barbeque. Then, we proceed to the Korean minimart and got ourselves some Korean ice-cream that tasted so yummy. I ate the Korean Bibimbap last Sunday at KimchiHaru, Subang Jaya. This is the food that I always order when I go there. It is rice with vege, egg and chicken. I like it. Generally, Korean food is less oily. Therefore, it is good for our health. OK. that's all for today. Vist me again and I'll talk about other beauty stuff. I didn't know that Korean food is hard to find there. Korean barbeque is very nice indeed.